Replaced my roof very quickly. The crew was friendly and respectful. They cleaned up everything, and did an fantastic job. I am very pleased with the outcome and the appearance of the roof. I had no insurance coverage on the roof. I was about to lose insurance coverage on my entire home. They were done in time for me to get full insurance coverage again and renegotiate for a lower price. 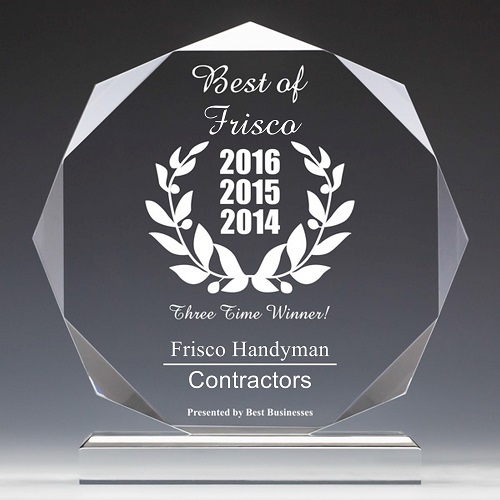 We had a huge issue with our master shower and I found a flyer from Frisco Handyman so I called. He called back quickly & gave us a very reasonable quote to completely rebuild our shower. He took us step-by-step through the entire process, keeping us very involved & updated throughout the entire two day repair job. He did excellent work and has worked on many projects for us ever since. Recently, we had him landscape the front yard, replacing a bunch of old, nasty looking shrubs with potted flowers and a sprinkler system for our foundation. It was done exactly how I envisioned it! He did an outstanding job rebuilding my outdoor deck and he completed it in a timely manner. We have been very satisfied as we enjoy it every day. We plan to remodel my office in the future and there is no question that John will be doing the remodel. His estimates are very reasonable, his work is outstanding and I trust him totally. I have known John for many years. On a personal level, he is honest, trustworthy, capable, and knowledgeable in many areas. John has done several jobs for me. I am very happy with the new marble flooring in my entryway; the carpet in my Living Room; and inlaid custom tile in my dining room. He also designed & installed a unique porcelain tile floor in my kitchen with custom baseboards. I especially liked the attention to detail. He went the extra mile.